You have to mod your Rev. E1b to Rev.F first see here and here and then you could skip Rev. G and go on to the latest Rev. H.
For those of you in the UK - I grabbed a H from retrotowers.co.uk in 1-2 days shipping time, I had to make sure first by calling them but was pleased to grab a H revision since modding small pcb's isn't something I'd want to risk with 190$ cart avoiding e/g/f for that reason . hi guys,just installed borti's pcb to my upgraded e1 to revg sd2snes. i have picture and sound,no smoke,so all went well. 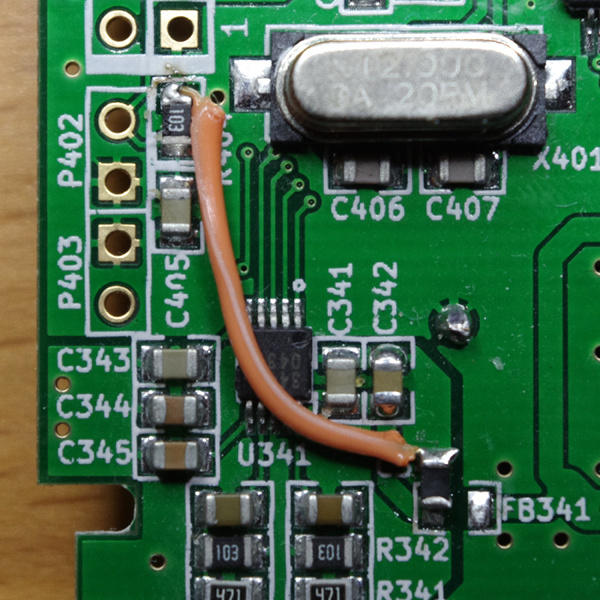 You forgot to short JP341 and to reposition the FB341 ferrite bead (you have to feed the PCB with 3.3V, not 5V such as in your picture). i desoldered jp341 and bridged it and repositioned fb 341. @lee,i did not read anywhere it was only for rev F,thought it was also on e1,now,it is working fine. but modded like you say for nothing,in the future gona wait and ask here if its needed to mod. lucky i did not brake it. hi ikari,yep,it seems i notice the volume is louder now. chip TS922IDT is good or not? as usual...nobody replied to me. Idiots.. I ask because I think the MSU-1 feature is great, but I don't really use it much. I don't know if I want to perform these operations on my SD2SNES just for audio improvements I'll rarely notice. My understanding is that it's only for MSU-1 stuff. That's why I haven't done the mod on mine; no sense risking borking a $200 device for a feature I rarely use.